Vladimir Jurowski continues to ring the changes in terms of repertoire, with this evening’s concert by the London Philharmonic Orchestra no exception in featuring the UK premiere of Eine Herbstsymphonie, the most ambitious undertaking from Austrian composer Joseph Marx. Although best remembered for his substantial output of songs, Marx (1882-1964) spent the decade after the First World War essaying large-scale orchestral works – chief among them being this Autumn Symphony premiered (by Felix Weingartner) in Vienna during 1922 but which went unheard as a complete entity for eight decades after its 1925 revival. Marrying impressionistic harmonies to a Mahlerian formal expansiveness, this is an evocation of its season both in descriptive and philosophical terms – in music as opulent as it is engulfing. What it lacks is any sense of a cumulative or even over-arching momentum. Sizable forces are deployed expertly if amorphously in terms of the dense yet unvarying texture – though this was hardly the fault of the LPO, which responded to Jurowski’s incisive direction with assurance. Not least in the radiant Autumn Song – less a movement then a prelude to what follows and segueing into Dance of the Noon Spirits, an extensive intermezzo that suffers from its overly uniform waltz-time measure and corresponding lack of rhythmic contrast. This latter failing is hardly an issue in Autumn Thoughts, a slow movement where serenely unfolding paragraphs and taciturn solos for wind and strings effect a yearning regret such as draws in the listener whatever its lack of defined melodies. After which, An Autumn Poem provides a finale of Dionysian import – the full orchestra (nine percussionists in addition to timpani and keyboards) moving through a series of increasingly heady climaxes before the music subsides into a postlude suffused with eloquent resignation though tinged by regret. A significant work historically, then, but hardly a neglected masterpiece that warrants regular revival. Jurowski can only be commended for instigating this performance, as for encouraging so committed an orchestral response as will hopefully find its way onto the LPO’s own label. Even so, it was the first half that brought greater rewards. With its inspiration in a typically melodramatic story from Ivan Turgenev and breathing an aura of fatalistic dread, Chausson’s Poème has made a welcome return to the repertoire and has also found its ideal exponent in Julia Fischer – her warm and caressing though never over-wrought tone teasing out those expressive nuances which lurk beneath the surface of this emotionally all-enveloping score. Whatever else, its composer experienced the essential qualities of his music in graphic terms. Latter-day revivals have tended to pair this piece with Ravel’s jarringly contrasted Tzigane, but Fischer choice was far more apposite. Even more overlooked, Respighi’s Autumn Poem itself pursues a full-circle trajectory such as takes in reflection and animation, though one whose overall conciseness proves its own justification. Fischer duly spun the deftest of solo lines through the diaphanous and modally-inflected orchestral texture, in which Jurowski’s accompaniment was astute and affecting in equal measure. Sometimes, less really is more. Of all his nine symphonies, the Fourth, completed in 1935, is the one that sounds least like Vaughan Williams’ work. If you didn’t know the composer, you could be forgiven for thinking it was a wartime Russian work. Such is the explosion of anger at the start, the ongoing the desolation in the slow movement, the very notion of VW being a ‘green and pleasant land’ composer is thrown right out of the water. The Eighth Symphony of 1955 is much more amiable in mood. It is not well known among the composer’s output but there are some lovely sonorities here, such as the beautiful textures at the start, where Vaughan Williams harnesses a number of percussion instruments. Celesta and vibraphone blend beautifully to make music that sounds as if it originated a lot further east than the North Sea! The large percussion section also includes three tuned gongs. The middle two movements dispense with these instruments – the third becoming a gorgeous romance for strings – while the closing minutes are full of joyous music. This is a disc of two halves. 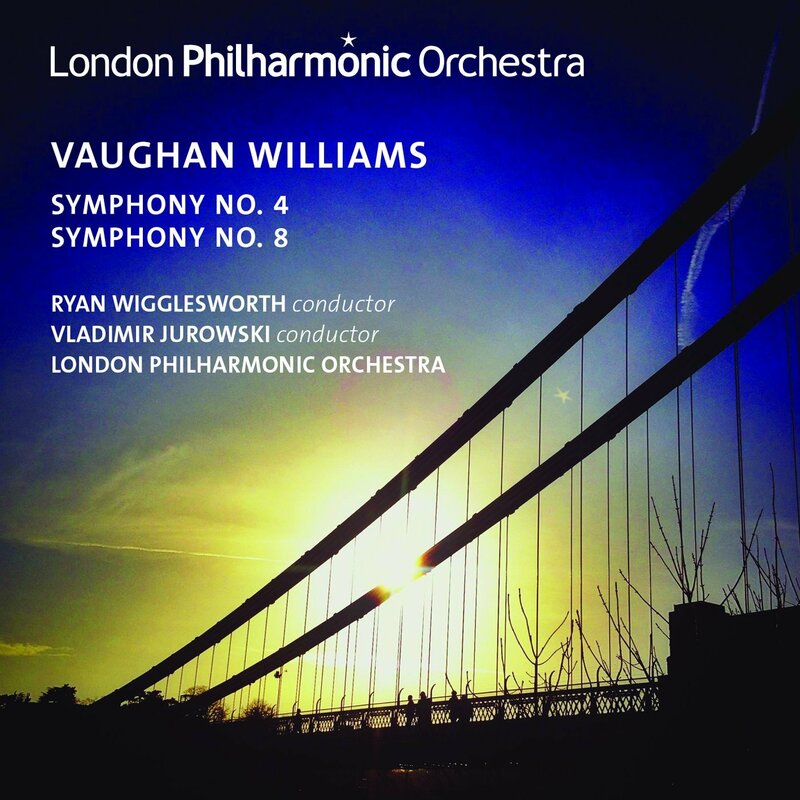 The Symphony no.4 is given a strong performance but feels rushed at times, especially in the fourth movement, where Ryan Wigglesworth zips through a lot of the arguments so fast that they sound just a bit perfunctory. That said, the fall-out at the end of the first movement makes quite an impact, the coda sounding truly desolate, while the second movement Scherzo is spot on, thanks to a superb bassoon contribution. In contrast the Eighth Symphony receives an affectionate performance under the direction of Vladimir Jurowski, enjoying the use of the percussion at the start, mysterious yet rather exotic too. The Cavatina is the emotional centre of this piece, ending with a lovely cello solo that rises through the layers at the end. From this point the last movement Toccata is a joyous celebration, sounding English in its folksy tunes but again enjoying the shimmering sounds the tuned percussion have to offer. Jurowski’s performance of the Eighth is recommended without reservation, a beautifully constructed performance that enjoys the unusual orchestral colours but which is keenly emotive too. The recording from London’s Royal Festival Hall is excellent. Wigglesworth’s Fourth – though well played – is good but not so fine that it displaces the formidable competition among its rivals. Recordings conducted by Sir Adrian Boult, Vernon Handley and Bernard Haitink are all preferable in this respect.